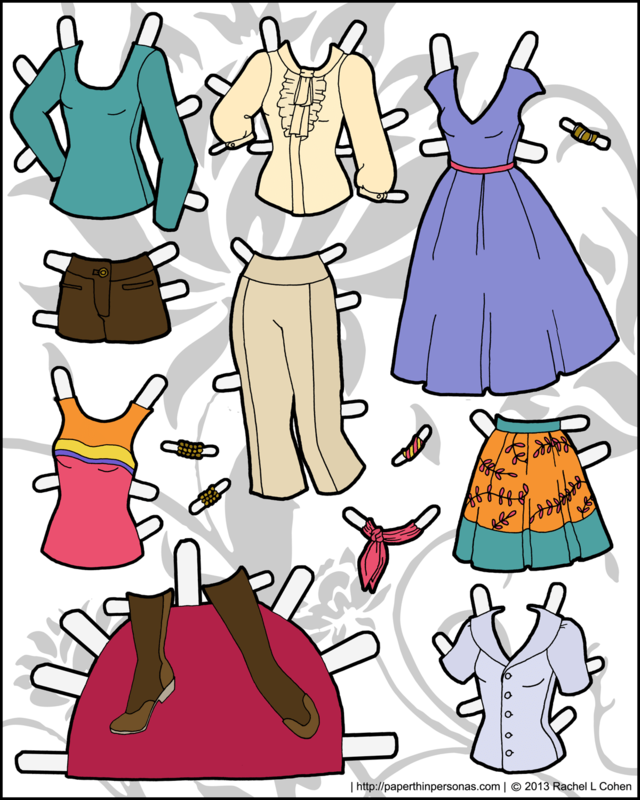 Paper doll blogs are odd creatures. I think all craft blogs are odd creatures, but I don’t do a general craft blog, I do a paper doll blog, so I don’t think I’m qualified to talk about all craft blogs. 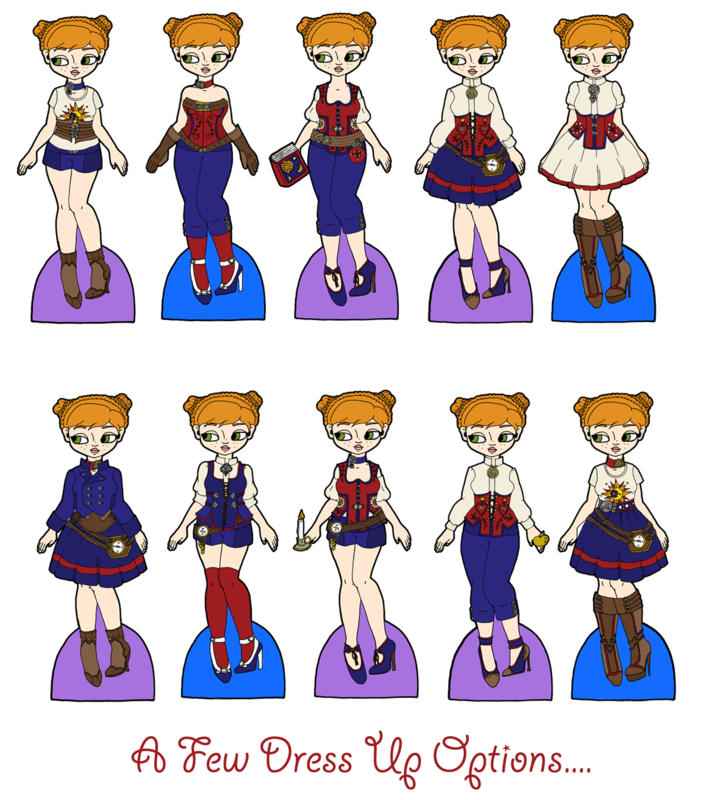 The thing about paper doll blogs (and all craft blogs, I suppose) is that you, the author, is creating all the content. It’s not a matter of reviewing something which exists or responding to the latest news story, it’s a matter of producing work. Work production takes time, energy and inspiration, but mostly work. Hard work. And I tend to work in spurts. So, I would be lying if I said that I drew these dresses this month. I didn’t. I drew them… I don’t even remember when. At least one sketchbook ago. They’ve been sitting, finished, on my computer waiting to go up until I had something coherent to say about them. 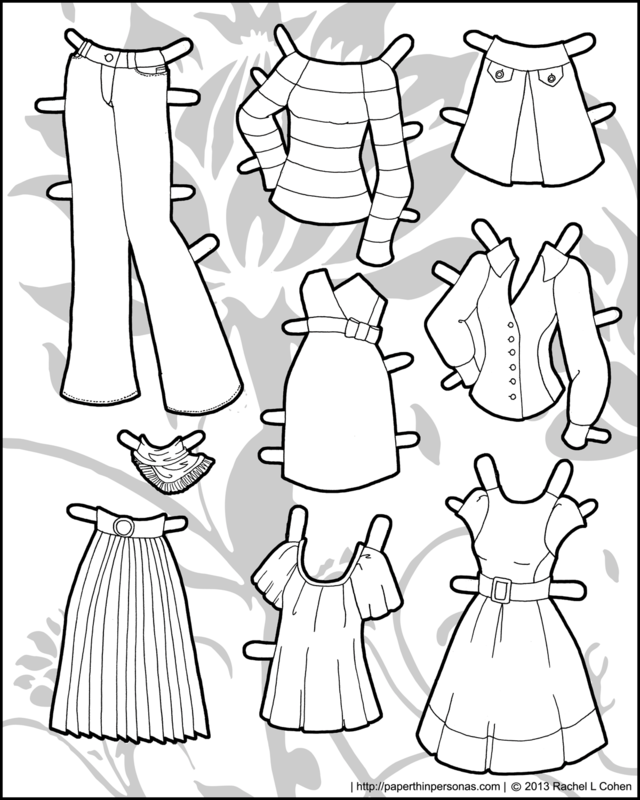 Well… I don’t have anything coherent to say about today’s printable paper doll clothes, but I knew if I didn’t get them up than I would regret it. I don’t have anything else to post today and I wanted to get a post up this week. I’m not ashamed of that and I’m not ashamed of the paper doll clothes. I think they’re pretty darn cute. Happy Halloween! 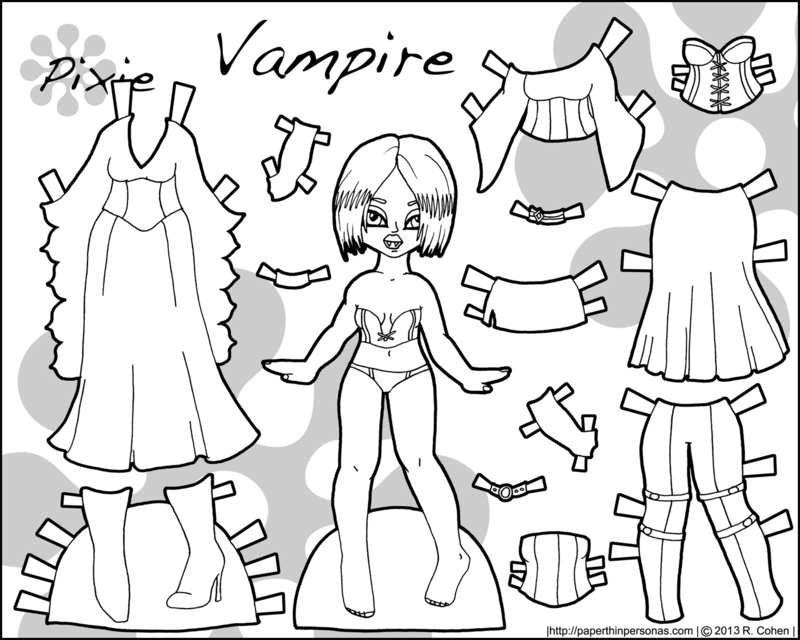 Have a Vampire Printable Paper Doll! So, confession time: I’m totally excited at the prospect of getting to sit at home tonight and possibly give candy to trick or treaters. I don’t know if there will be any, but I’m hopeful there might be. I have a small bag of candy at the ready. I know I won’t get very many, but I do love tricker treaters. Little kids are so cute dressed up in costume and I have fond memories of my own tricker treating days. 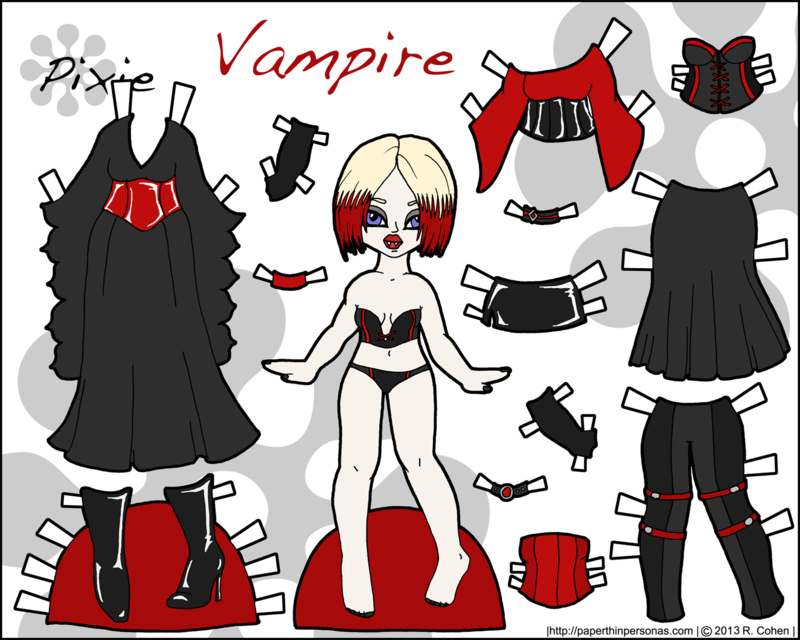 To go along with the holiday spirit, we have a possitively fablous, if somewhat skanky, vampiress paper doll. She’s got her black dress, her miniskirt and her corsets. All very 1980s gothic. There’s something very sexual about vampires. I could get into the sexual imagery rampant in Dracula or Carmilla, but I never got a graduate degree in English for a good reason and it had a lot to do with having low patience for analyzing literature, but I digress. I’ve done vampire paper dolls before. In 2010, Marisole got to be a vampire with a questionable hairstyle. My only other foray into the world of the undead was a zombie paper doll which I drew as a joke after abandoning the blog for a while. I still feel bad when I leave the blog, but I don’t usually draw zombie apology paper dolls. By the way, if you want your vampire paper doll to wear something a little more… lady like, shall we say… than remember she can share the clothes of all the other Pixie paper dolls or find a victim friend among the Pucks. Unless we take a page out of Carmilla, and then she’ll be getting her victim from the Pixies. Marisole Monday & Friends: Flowers and Jewels in Full Color! 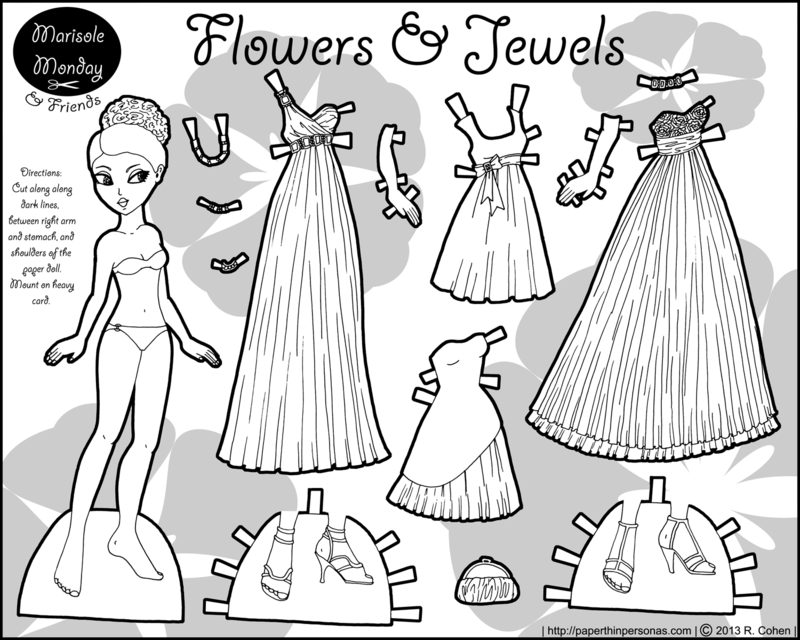 So, we had the black and white version of this paper doll set last week. 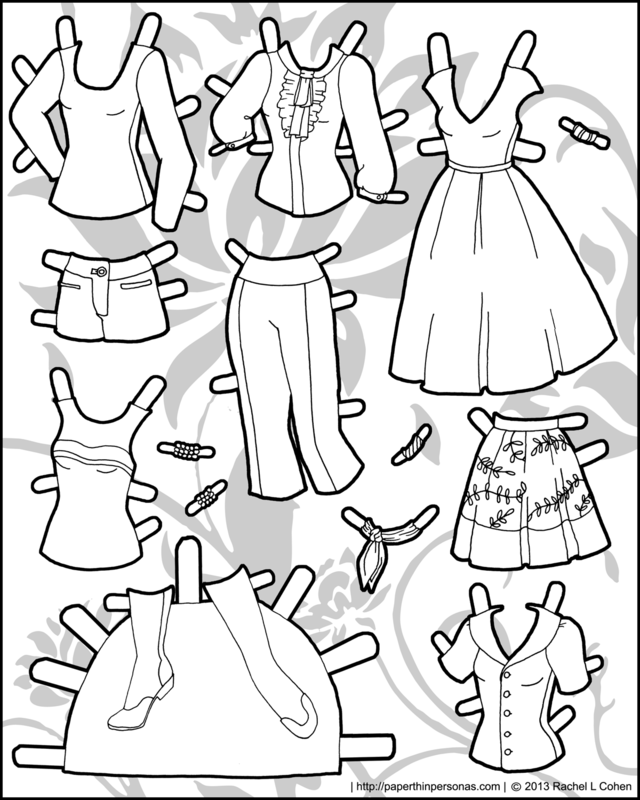 Sometimes, I feel like I don’t do a good enough job linking the full color versions of the paper dolls with the black and white versions of the same paper doll, but then… I also sort of figure that people are smart enough to figure it out. I don’t like treating my readers as though they’re stupid. 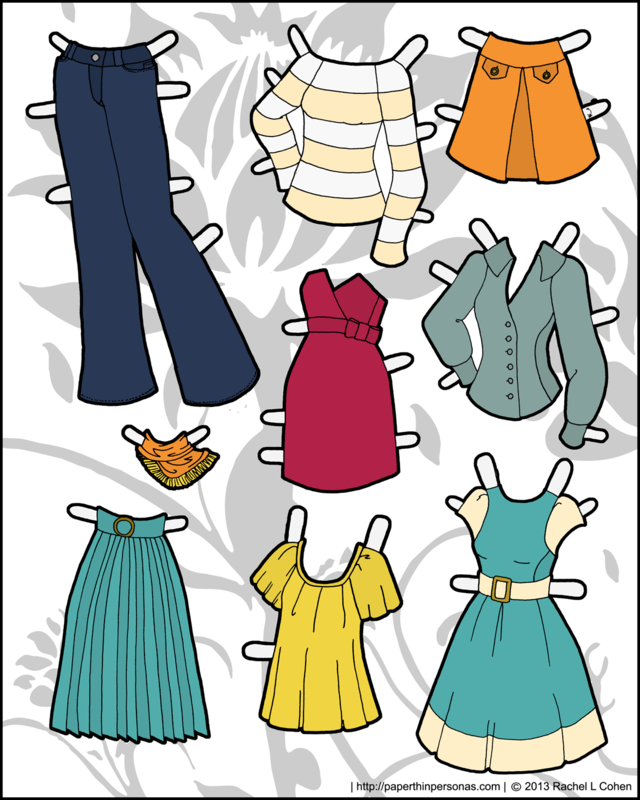 Anyway… I had a lot of fun with today’s paper doll. Her underwear is the same color as the site’s base color which is Hex Code 990033. Her skin is the warmer of my two medium brown colors that I like to use Hex Code d29569 from the Skintone Pallette. It’s got more orange in it than some of the colors I use more often, so I tend to be careful what colors I pair it with. The dresses are a range of colors whose Hex Codes, I can’t remember at present. I wanted to use Jeweltones, but not get too dark. Autumnal without getting into the orange, yellow, red, brown combination. Anyway, I think I’ve run out of things to say about the paper doll. Enjoy her. This magnetic paper doll set has the honor of being the least well known, I suspect, of the fairy tales I wanted to do, but it also happens to be my favorite fairytale, or at least one of my favorites. East of the Sun, West of the Moon is a Norwegian tale which I like because the protagonist is not a princess and she largely saves her prince, rather than the other way around. I love the idea of the mythical castle that lies, “East of the Sun, West of the Moon” and when I was a child, I owned a lavishly illustrated edition. This posted ended up really long, so I put a break into it. One day, a white bear who offers the poor farmer a huge dowry for his lovely daughter. The daughter is reluctant, but eventually agrees. The bear takes her off to a fancy castle where she lives with him. At night, he takes off his bear form in order to come to her bed as a man, but she never sees him. After a while, she gets homesick and the bear says she can go home as long as she agrees that she won’t speak with her mother alone. Of course, there wouldn’t be much of a story if she didn’t speak with her mother alone. Her mother, worried the Bear is really a troll, gives her daughter a candle so she can see what he looks like at night. The daughter lights the candle, finds out he’s a hot prince, but spills three drops of the melted tallow on him. Waking up, he tells her that he has been cursed and now must go marry a hideous troll who lives in a castle East of the Sun, West of the Moon. In the morning, the castle has vanished and the daughter sets out to get her man back. So, I actually drew this, colored it and re-sized it before I left for Alaska and before my apartment flooded. It feels weird to be posting it now, but also very nice to be getting back to the blog a little. A tiny moment of normal in what has been a very insane few weeks. I normally tend to be someone who carefully considers options, procrastinates, gets distracted, gets bored and then, after much dawdling, finally does something. If my parents are reading this, then they are saying… Yeah, that’s about right. So, suddenly all of my procrastination habits went out the window and I found myself having to just get things done. Finally, I’m sitting at my tiny dining room table in my new place feeling good, dislocated, confused, frustrated, but…. at least not homeless. And not homeless is a pretty impressive state at the moment. I’m still unpacking, organizing, looking for things that got thrown into boxes. I am pleased to say that none of my sketchbooks were ruined (a few were damaged) and none of my journals were ruined (a few were damaged). I still have my master copies of all my paper dolls (thank the heavens for plastic containers). I’m pleased and thankful for all of this and for the kind words I’ve received from readers. I don’t know if I’ll get a Marisole up next week or when the next post will happen, but hang in here with me guys. I’m trying my best. I decided my Tanya paper doll was lonely and needed a new paper doll friend. So, I created Kira, a stylish African American paper doll sporting a retro look. Her hair was inspired by the 1930s. Her shoes are very modern though and she can wear any clothing from the Ms. Mannequin paper doll series. If she needs more friends, eventually I do plan to draw more Ms. Mannequin dolls. These things take time, so be patient with me. Of course, I’ll have to return to Alabama, which is lovely as well, soon, but in the mean time, I’ve been thinking a lot about how much I love and miss Alaska. Anyway… I think of Kira as a vintage inspired sort of elegant lady. Her style is distinctly art deco, in my head. How much of this resembles reality? That’s hard to say really… there’s nothing terribly vintage about her shoes. Still… she’s elegant and put together and that’s what I’m going with. Have I mentioned I’m a little sleep deprived from the traveling thing? Well… I am.